plantations, may be involved in some specific catchments. A drying climate has left Leeuwin-Naturaliste Ridge aquatic cave habitats and their stygofauna in a critical state. Published in the Journal of Australasian Cave & Karst Management Association, research by Dr Stefan Eberhard and Ms Sarah Davies reveals the loss of 95 to 98 per cent of known habitats in Jewel and Easter caves. Complete loss is predicted within five years without immediate intervention. From 2003 to 2010, Tiffany’s Lake within Easter Cave has receded from 50m2 to a residual pool of only 1m2, with a depth of less than 0.2m. Jewel Cave pools have dried up completely. Forming the greater part of the Jewel Cave Karst System, the caves are home to two unique and critically endangered species of stygofaunal crustaceans: the amphipod Uroctena n. sp. and the ostracod Areacandona admiratio. “The stygofauna communities are threatened by loss of aquatic habitat resulting from declining groundwater levels and reduced stream flows experienced during the previous 15 years, and particularly during the past five years,” says Dr Eberhard, Director of Subterranean Ecology Pty Ltd. According to Dr Eberhard, a recovery plan prepared by the Department of Environment and Conservation (DEC) has failed to improve the conservation status of the stygofauna communities. Though preliminary hydrological modelling suggested harvesting rainwater at Jewel Cave was a feasible option for abating groundwater decline, the DEC’s recovery plan recommended against supplementation based on assumptions that lower water levels may have occurred in the past and deeper refugial habitats for stygofauna might exist. “The watertable in the Jewel Cave Karst System is at the lowest level ever recorded, being 2.5 m below the maximum level recorded since historical measurement commenced in 1958, and 0.6m below the lowest palaeo (Pleistocene) level for which any dated stratigraphic evidence exists,” says Dr Eberhard. 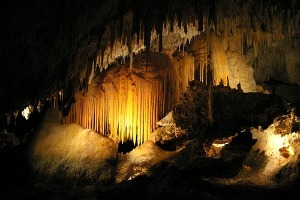 While no DEC action has taken place since the study’s publication, the Augusta Margaret River Tourism Association and Subterranean Ecology Pty Ltd have secured funding through The State Natural Resource Management Program to investigate the feasibility of a recovery trial in Jewel Cave similar to the successful recovery underway in Lake Cave near Margaret River.